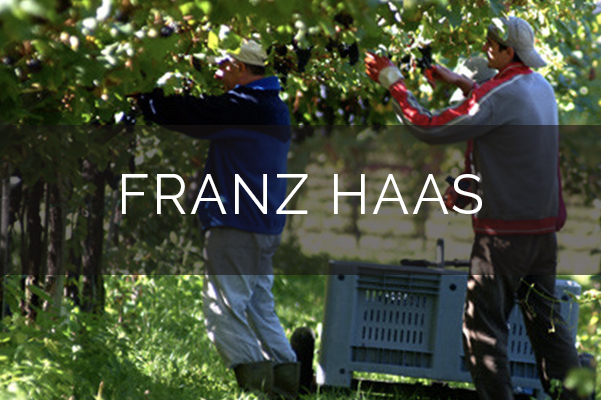 Since its establishment in 1880, the Franz Haas Winery has endeavoured to produce top quality wines. Situated in the Alto-Adige in the far north of Italy, the winery has been lovingly handed down through seven generations, from father to son, each of them sharing the name Franz Haas. Their grapes are sourced from 55 hectares of vineyards which are a mix of those they own, rent or contract. The Alto Adige is a mountainous region and due to global warming it was decided in 2000 to plant some new vineyards on the cooler, higher slopes, some more than 850 m above sea level. This has resulted in some wonderful, elegant and fragrant wines. Apart from unique and delicious wines, Franz Haas stands out from the crowd with its beautiful, eye catching labels. Simple but dramatic, they were designed by the esteemed artist Riccardo Schweizer who used to paint with Picasso, Chagall, Cocteau, Paul Éluard and Le Corbusier. When Franz released his new range of wines in 1990 his wife, Maria Luisa Manna presented the labels to him as a lucky omen. Many years on, these artistic labels still attract attention as they reflect the quality and creation within the bottle as well as without. Franz Haas is particularly famous for its wine named Manna, first released in 1996. This is an unusual blend of white grapes, created especially for its versatility and to accompany a wide range of courses throughout the long Italian lunches and dinners. Visit Franz Haas’ website here.